Late that night the steamer got to San Pedro, and you may be sure Tom and Retta were up early the next morning. As they came off the boat, there was a crowd of people on the wharf who were pulling in yellow-tail as fast as they dropped their lines. This fine fish is a little like a big salmon, but with golden-yellow fins and tail. Its body is greenish gray, with spots of the prettiest rainbow colors, which grow brighter as the fish dies. These fish bite easily, but as soon as caught begin to rush back and forth, fighting and trying to snap the line. 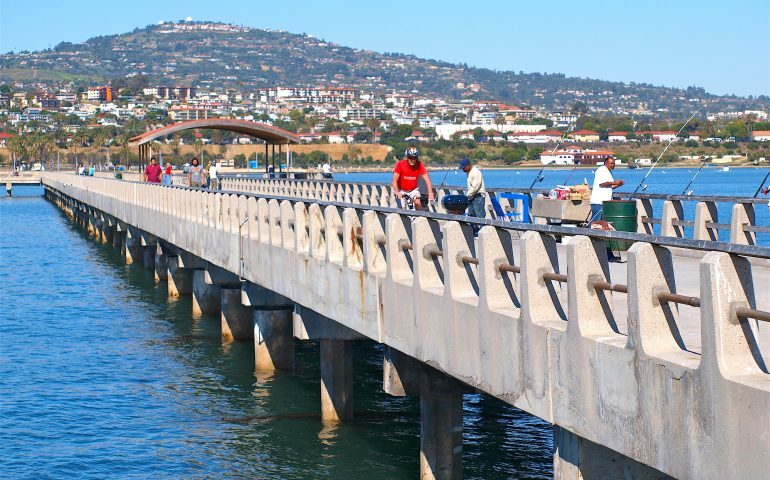 Although the Cabrillo Pier has received considerable vandalism and damage over the years, it seems to once again be a pleasant and reliable pier to visit. The pier was built in 1969 and anglers can almost always expect to catch some mackerel, a few tom cod (white croaker) or maybe even a halibut or two. 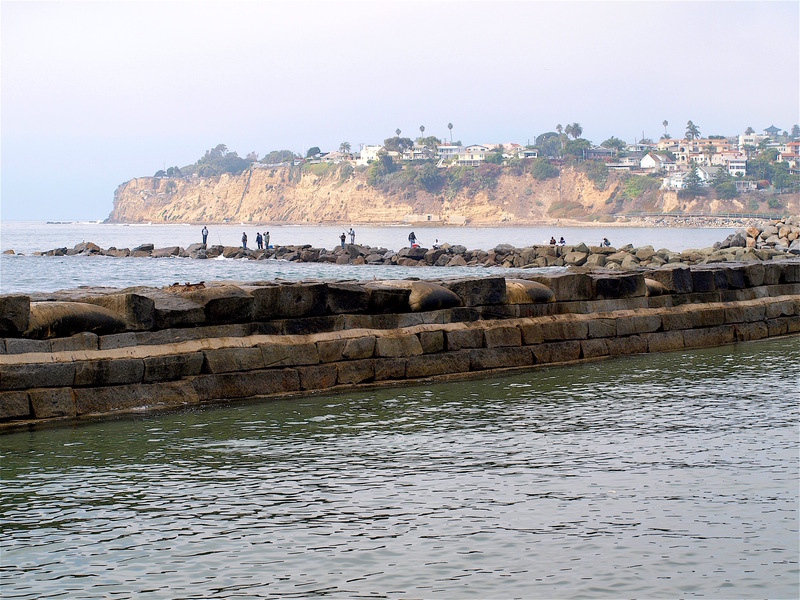 If they fish the far end of the pier, along the inside waters adjacent to the breakwater, anglers will often catch rock frequenting species. Given the inner-bay location and its nearness to the breakwater, anglers are offered a fairly unique fishery environment. It is also an interesting area to visit for the family. 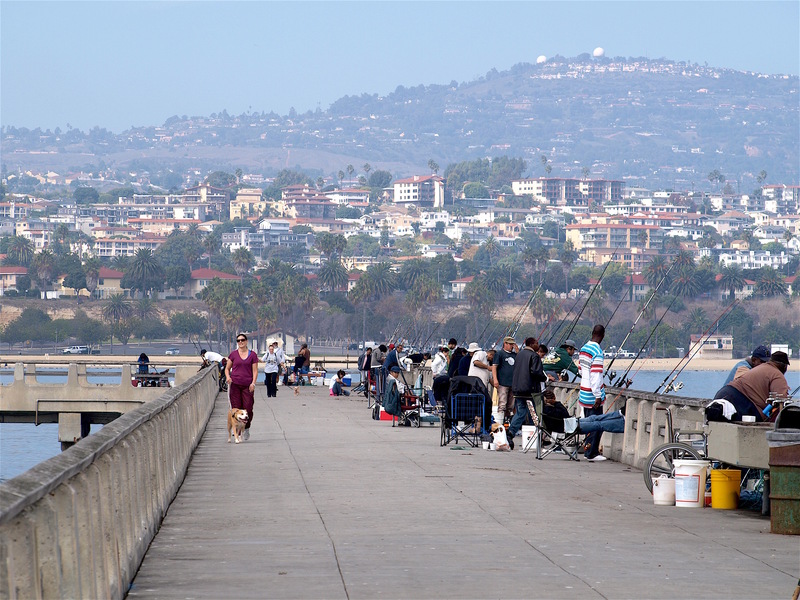 Cabrillo Park offers non-anglers in the family a tree-shaded park with picnic tables and playground equipment, a beach area, a small store, and a marine museum that has many interesting exhibits. The pier itself has, like most piers, its regulars. One day I was quietly fishing on this pier when I ran across one of these regulars (a.k.a. experts or pier rats) who make pier fishing so special. I had caught a few white croaker and queenfish, and a halibut that was, like most halibut today, a few inches short of being legal size. But on the deck, so to speak, were also some mackerel. I hadn’t hooked any of the macs but a few more successful anglers had caught fish that were truly impressive. They were among the largest mackerel I had ever seen caught from a pier. Many were equal to or larger than a typical bonito. About that time, an elderly angler strolled out and asked if I minded if he fished next to me. As usual, I had no objection, and soon he was setting up his fairly heavy-sized tackle. His terminal tackle was unique. He used two leaders, each of which was about eight-foot-long and contained what I would guess was a no. 2 hook. His line was attached to one eye of a triple swivel and a leader was attached to each other eye of the swivel. Above the swivel he attached a large Styrofoam float. He baited each hook with a large piece of mackerel and proceeded to cast out the entire rigging. He soon started to hook the extra-large mackerel and about that time I decided to give the mackerel a chance. I proceeded to catch six mackerel using my light outfit, a single hook, and a float. My neighbor caught at least a couple of dozen fish, sometimes two at a time, and then he stopped. He said he only caught as many fish as he could use and that he had requests from his neighbors for these fish. We talked for a while and it turned out he was a retired commercial fisherman who had fished with his Portuguese friends in his younger days. He now limited his fishing to the pier. He knew that some would view his techniques as non-sporting but said none of his fish were wasted, nor did he return injured fish to the water as did some of the less knowledgeable anglers. He said he fished the pier most days and generally caught fish, although few of the large fish that were caught twenty years ago. But once in a while the larger mackerel or bonito moved in and, when they did, he knew how to catch them. It was time for me to leave and as I made the drive back to Long Beach through the Terminal Island area I reflected on his views. Although there is a lot of room for anglers who preach the sportsmanship of light tackle and returning all fish to the water, I think there is also a place for fisherman like this, a man who was basically fishing for food and using what he caught productively. My only criticism would be on his judgment for using these fish as food since the Department of Fish & Game has warned against eating fish caught in this area (although mackerel are generally safe to eat). Environment and Fish. 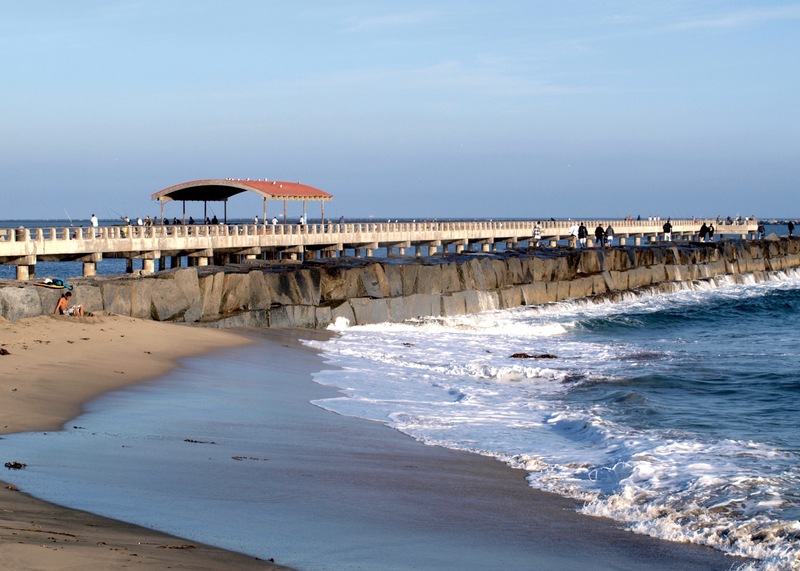 The pier sits low near the water and extends out 1,200 feet into San Pedro Harbor; it is just inside and parallel to the north end of the Los Angeles breakwater. 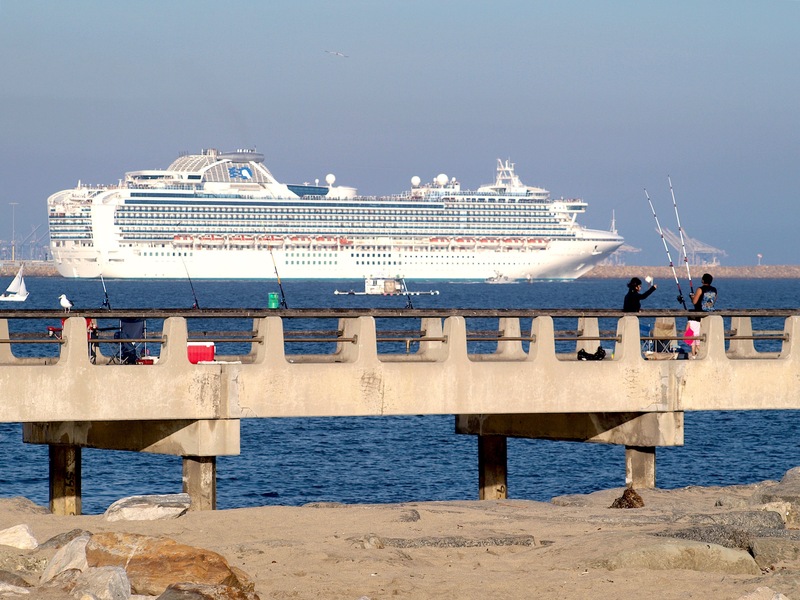 To me it’s an interesting pier because of the so observable contrasts: the adjacent low-lying jetty that separates the pier from the ocean, and the huge, heavily industrialized port that starts not too far out from the pier and covers most of the shoreline areas. 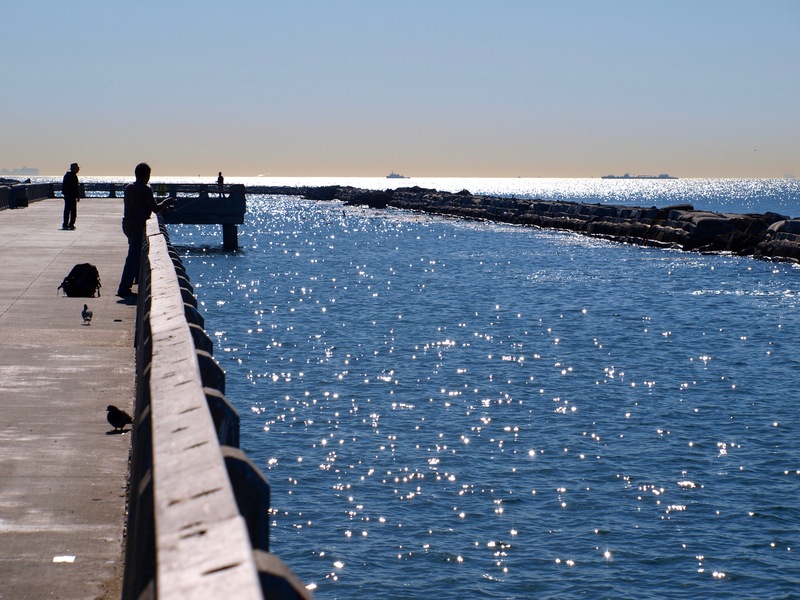 The entire area has been changed since the breakwater was constructed in the early 20th century but out there on the pier anglers can enjoy the fresh air, the fish, the sea birds, and of course the companionship of fellow anglers. 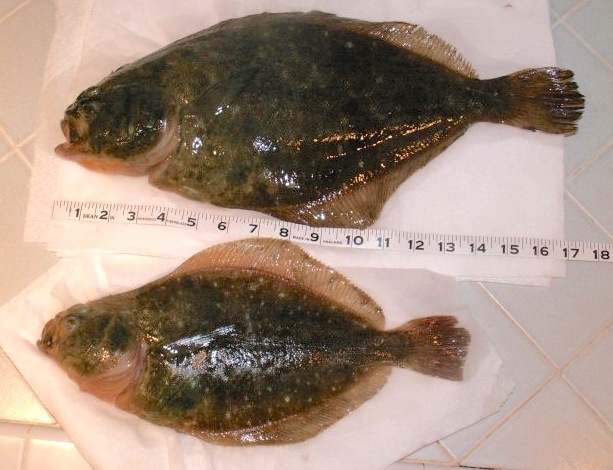 The bottom around the pier is primarily sand and soft mud and most of the normal bay and surf species can be caught. Although an artificial reef was constructed in 1973 when 84 automobile tires were scattered around the pilings as an attractant for the fish, most of them are now covered with mud. The pilings do attract some rock-frequenting species but the most common fish are still two of the smaller croakers: white croaker (in part because these fish are the most pollution-tolerant species) and queenfish. Halibut, turbot, sand bass, white seaperch, and sculpin (scorpionfish) comprise most of the rest of the bottom action. Small pompano (Pacific butterfish) are a mid-water species that is most common in the fall. Unusual flatfish have included a 13 ½-inch fantail sole taken in June of 2007 while a tiny, baby bocaccio was taken in September ’09. Surface action generally sees Pacific mackerel (this is one of the more reliable piers for mackerel) and Spanish mackerel (jack mackerel), jacksmelt and topsmelt, and, at times, bonito. Barracuda are a fairly common fish but most will be sub-legal size “pencil” barracuda. A live bait barge is located not too far from the pier, a barge that undoubtedly attracts some fish into the area. The west side of the pier sits within casting distance of the inner side of the breakwater although much of the water on that side is now fairly shallow. In 1991 a sand replenishment project was carried out on the outer beach (outside the breakwater) and ever since then the winter storms sweep more and more sand over the breakwater and under the pier. Thus the inner half of the pier sees mostly sand on the west side. However, as you get into the deeper water out at the end you can see some very decent fishing for several different types of rock and kelp frequenting species—kelp bass, spotted bay bass, sculpin (scorpionfish), cabezon, small kelp rockfish, sargo, and seaperch—black, white, rainbow and rubberlip. Along with these will be an occasional opaleye, halfmoon and sheephead. Although I haven’t personally seen too many sharks or rays, I’m told by the regulars that some good-sized shovelnose guitarfish have been taken, as well as leopard sharks, gray smoothhounds, thornback rays, round stingrays and bat rays. One day I even observed a small California skate taken by a surprised angler. Fishing Tips. The best bet is to fish the bay side of the pier on the bottom for small croakers and halibut, or fish the upper portions of the water for mackerel (they’re often down about 5-10 feet). If you want tomcod (white croakers), cut the tail end half of a small anchovy, and fish it on a high/low leader with no. 6 or 4 hooks. Remember that the tommies like moving bait and will often strike as the bait is settling to the bottom after the cast. If you don’t get a bite, reel in your line very slowly and be constantly alert for a strike. The same rigging and location can yield other croakers—yellowfin, spotfin, China, and a few corbina, but usually those species will hit better on fresh mussels, bloodworms, or ghost shrimp. For the halibut, use a sliding leader and live bait—smelt, small shinerperch or walleyes, brown bait (small queenfish or white croaker), or a baby mackerel if they’re around. Artificials can also produce some flatties with locals usually using lures such as Big Hammers, Worm Kings, large white Blams, and green Krocodiles. 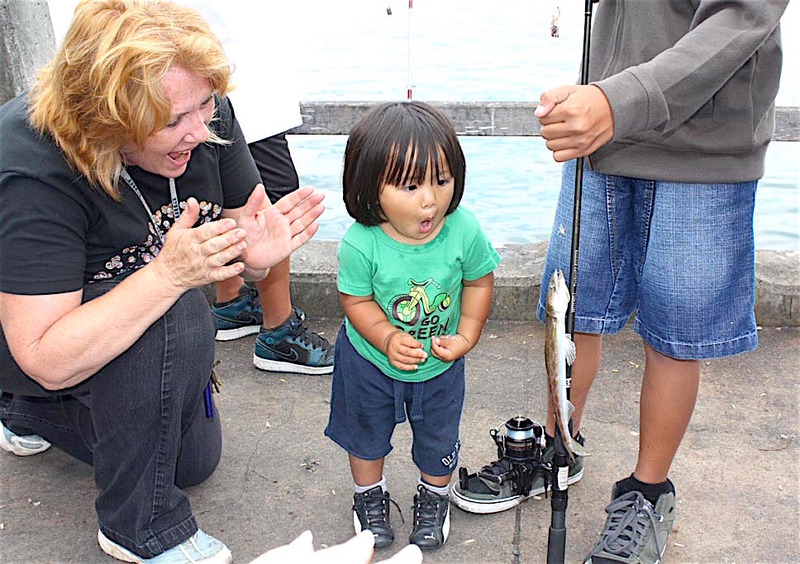 Live bait for halibut can be especially productive when the schools of shinerperch move in around the pier in early summer. A 41 ½-inch halibut was taken in July of 2010. Try on the top or subsurface for mackerel and since water here is normally calm, you can often simply tie a hook directly on the end of your line and fly-line your bait out to where the fish are hitting—or use a small twist-on sinker for weight. Many anglers like to use a bobber with the small sinkers but it usually isn’t necessary unless you’re trying to fish with two poles at the same time. If you’re fishing at the end, where the water is deeper, you can often drop your bait straight down a few feet under the surface of the water and watch the macs and jacksmelt attack your bait. 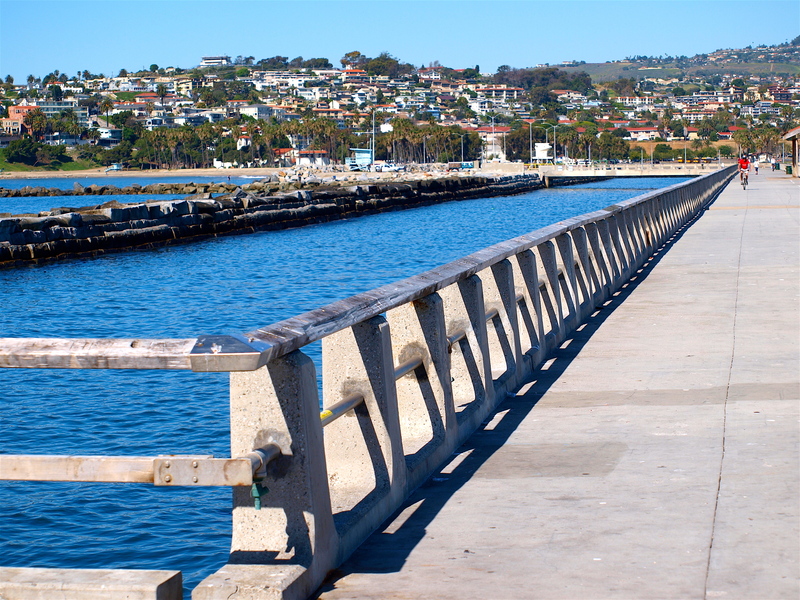 Where can I purchase early morning bait (anchovy’s) is San Pedro to fish off the pier?